There can be no doubt. I have been a lifelong, dyed in the wool gearhead. Some of my earliest memories involve wrenching with my father on Austin Healeys, helping to rebuild SU carburetors on our basement workbench. And when his restorations were finished, the cars were not stored away under glass, never to be touched, but were instead used as originally intended, driven hard, maintained well, and fixed when needed. He was also never interested in cars that could easily be lost in a parking lot. Instead, everything had to be unique. Not to impress other people, I don’t think he could have cared less about what other people thought, but it gave him pleasure to be different – even if only he knew. I’ve carried these philosophies with me – and automotively speaking – they’ve taken me to some interesting places. My first car in high school was a 1967 Volvo 122s wagon. It had a factory wood roof rack and an upgraded twin carburetor B20 engine. It howled at 80 MPH on the highway and my friends loved to hit the overdrive switch on the metal dash. The car would hesitate, shake, and jump into the next ratio. I followed this with multiple Alfa Romeo GTVs (both 1750s and 2000s), and in college, a GTV6 that, as my roommate would tell, automatically threw open its passenger door on sharp left turns. I’ve done the Mercedes AMG thing, Porsches, a MINI Cooper JCW and a bunch of Saabs. Fair to say, I’ve run the European gamut. I’ve raced a 1965 Austin Healey 3000, pitted and crewed for the same car and run a successful vintage car show in the Hamptons at the former Bridgehampton Race Circuit. I’m also a lawyer in New York City – which, as other city gearheads can appreciate, is complicated. Stepping out to the car to wrench for a few minutes with your morning coffee is not doable for most of us. We don’t have attached – or unattached – garages. Our tools are not neatly stacked in metal cases and racks next to our cars. Instead, our cars are usually kept in large garages and lots, far from our homes, or on the street. We have to pack our tools and parts before heading out to wrench. I am lucky enough to have two parking spots in the lot in my apartment building, spots which permit me to head downstairs at any time, night or day, to fiddle with my cars. My current daily driver – a 2016 911 Carrera – needs no real fiddling, but sometimes I like to go down and make engine noises in it during the night. The only problem with the 911? It doesn’t need me back. The car now has 15,000 miles and has been basically bulletproof. No squeaks, no shakes, nothing. It has dedicated snow tires and wheels, takes me skiing throughout the Northeast and never complains. I blew a brand new (argh!) snow tire last December in New York and I would never have realized unless the car hadn’t indicated zero pressure in one of the non-runflat tires. It’s that solid. I love the car, and it’s going nowhere, but it’s also not completely satisfying for me. It doesn’t need anything. There’s nothing for me to fix and then experience that intensely gratifying feeling of making something broken work again. For that, I have my projects. Right now, that includes a 1985 Mercedes 280 TE wagon and – the subject of this blog [have you been waiting long enough?] a 1991 BMW M5. I’ve always loved the E34 M5. I had my first “code brown” moment in my father’s Brilliant Red (Brilliantrot)1991 M5 as a freshman in high school in the mid-1990’s when, immediately upon being lent the keys for a solo drive, I spun the car a full 360 degrees through a busy and rainy intersection two blocks from my house, only to land safely on the a grassy embankment on the other side. The car had power. It had presence. It felt solid like nothing I’d ever experienced – rigid, as if even the exhaust had been welded to the frame. It was also amazingly durable. Save one heater core explosion and a clutch, the car went to over 220k miles (!) before he sold it for an E46 M3 ordered from Germany. The car still drove perfectly at that time. In discussing cars and completing projects together, my dad and I never forgot about the E34 M5, though. Newer cars didn’t seem to have the same over-engineered feel – and for good reason. The E34s were the last BMW M cars to be hand built at a separate factory in Garching, Germany. Each car was signed by its maker behind the front bumper cover, and legend has it that the test drivers from the M division could pick out which engineer assembled each car, as they all drove a little bit differently. And they only built a little over 1600 for the United States from 1991-1993. That is rare. Upon selling my last completed project car, a beautiful brown 1977 Mercedes 280 E on Bring A Trailer, I knew what I wanted for my next project: an E34 M5 – and the hunt began. I scoured the internet for something that suited my needs: no rust, no major mechanical issues, but something that needed me – needed a new caretaker. I posted on various BMW bulletin boards, spoke with countless interested parties, all who also saw the market for these cars beginning to finally rise. Nothing felt right. Then, randomly, I received a message from a retired individual in New Orleans who had an alpine white over black ’91. The car had spent its entire previous life in Texas, and was completely rust free. As a bonus, the owner had recently installed a brand new suspension and front end, replacing a myriad bushings along the way. He had several other cars, hadn’t thought about selling until he saw my note, but something clicked and he felt that it was time to let it go if I were interested. I bought the white M5 nearly sight unseen in March – based on 15 or so grainy cellphone pictures showing matching vin tags on every body panel and not much else. I was told that it was missing some trim and needed new interior door panels (every E34 needs new interior door panels). But it was all there. Great engine, transmission and clutch. Along the way, the car received some upgrades that were not for me – and have been, or will be replaced. The wrong BMW M Technic steering wheel had been installed and it wore 18x9” BBS / BMW style 42 wheels, that while gorgeous, did nothing for the lines of the car. The car had all of its vacuum hoses and a majority of its coolant lines replaced with red silicon bits. Nope. Nope. Nope. The badges were faded and cracked from the Texas sun and the driver’s side seat bolster – the car has deep factory Recaro seats – had torn from years of entries and exits. The car has a Magnaflow exhaust and emits a deep rumble that occasionally sets off car alarms. Also, there’s a small oil leak from the oil pan (no problem, only the front sub-frame comes off to fix that …) and the door handle gaskets perished many moons ago. But to me, it’s perfect. The plan for the car is to address each of the above maladies and to bring it back to stock, or stock with period correct updates. 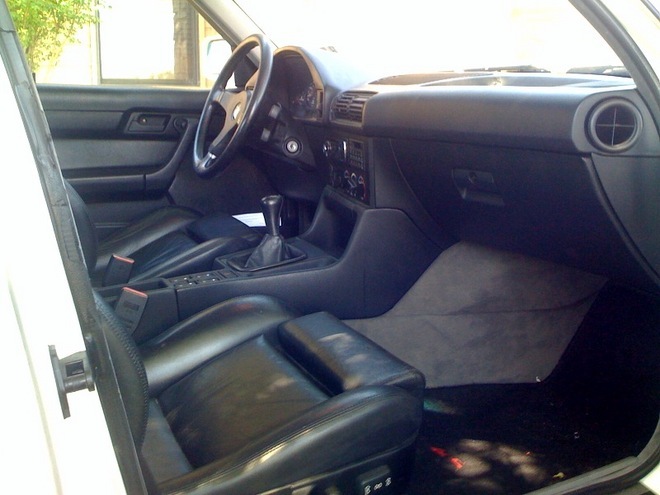 The interior will be refreshed, including – possibly – a black alcantara headliner if I can find a good shop in NYC. Mechanically, the goal is somewhat better than new, keeping the already installed Dinan performance chip, some version of a performance exhaust, a short shifter and new M Technic II steering wheel. Also, M Parallel wheels with high performance rubber. Most of these things I can do myself, and I will document them along the way in bringing this car fully back to E34 M5 Power. See you on the road. It’s about time someone does a segment on the E34. These vehicles don’t get the respect that they truly deserve in the States. I have two 525i’s, a 92 with a 5-speed & a 95 with a automatic. It’s so hard to find information about these beloved cars. Can’t wait for the next article.